We are proud to have Mr. Theo Manyama as an advisor for our DIG-SA Chapter. Theo will assist us in the creation of our rules of golf portion in our DiG C.A.P. program. 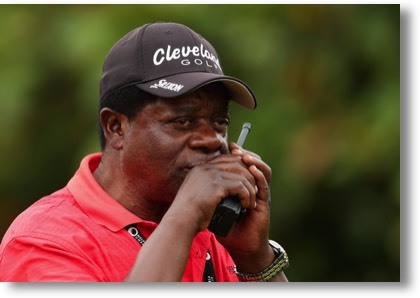 Internationally acclaimed golf-rules official Theo Manyama is a former professional golfer and former caddie with an intimate knowledge of the laws of the game and is in big demand at the majors. With a 25 year career, Manyama has served in 16 successive US Masters, nine US Opens and 19 consecutive British Open Championships. Officiating at the PGA Championship in August 2015 has allowed Theo to complete a full set in his distinguished career on international fairways and achieve a grand slam of his own. Manyama has also represented South Africa as a chief rules official and referee on the Sunshine Tour and at numerous events on the European and US PGA tours. “Manyama plays a very important role by enhancing the image of the PGA globally,” said PGA of SA CEO Ivano Ficalbi. In 2010, Mr. Manyama was inducted into the Mercedes Menz - South Africa Golf Hall of Fame. “Manyama’s a PGA master professional, and on the PGA of SA board of directors, and an honorary life membership of the PGA of SA.